"There is no place like home"...a favourite quote amongst many chess players. We are travelling so much and so often that we could almost say our life is based on buses, flights and trains schedules. Being awake for many hours in a row, dragging your heavy luggage and facing many unforeseen events, is part of the whole package, usually not a very easy affair:) So when you are finally back home, preferably with some extra rating points, money or a trophee, you cannot be happier than that. Right?! But still...when the tournament was organized according to the highest standards, when the place where it was held was an incredibly beautiful one, you just can't stop wondering how come time went away so fast. New friends, wonderful memories, new experiences, you miss them all, as if you left a piece of you behind. At least this is how I feel, when I look back to the tournament which just finished 3 days ago. You will understand my point of view when I will further say that the tournament was called: "Thailand Open Chess Championship", held in Pattaya this year, between 11th and 17th of April. 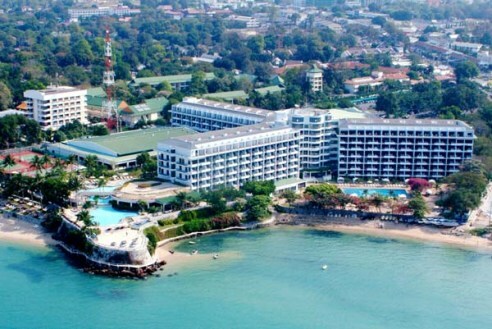 With a starting list counting 10 GM's, of which 4 players were above 2600 and one above 2700, with a total number of 141 players, held in a fantastic 5 stars resort, Dusit Thani Pattaya, the competition had all necessary ingredients for a successful edition. arbiters, gather together for a delicious dinner! And it is not just me to say this, a true-born traveler, delighted to play the best game ever in an exotic place like Thailand. The professional chess players who usually go to bed late in the night, after checking all possible lines (what else?! :), had the same thoughts, despite the tough tournament's schedule. 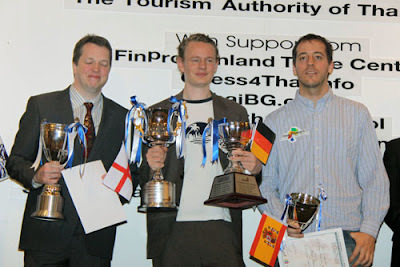 The critical moment in the tournament, when the winner has been more or less decided, came in the seventh round, in the game between Nigel Short and Jan Gustafsson. 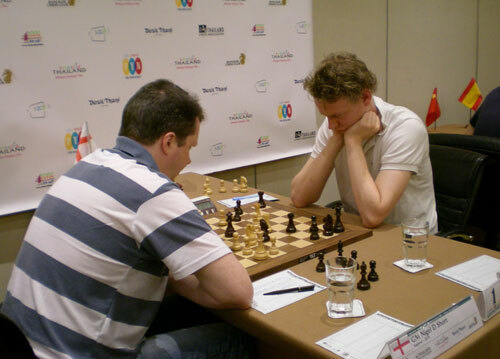 You can enjoy the game's analysis by the top GM Jan Gustafsson here! Next day after the game, during breakfast, Nigel was telling me that he just wanted to play his chance, he was having White, it was just one round that day, so he declined a legitimate draw offer. A loss came afterwards but I admire his attitude and the fact that he didn't lose his motivation after playing chess for so many years! Another important aspect which shouldn't be forgotten was the almost perfect organization and the tremendous amount of work the organizers invested in the tournament. This is just a part of my fantastic room! another huge TV, plenty of mirrors and amenities. Rainforest in the middle of our hotel! Lots of swimming pools around the hotel. The hotel was absolutely amazing, I think the best one I've ever had, the playing hall was capable to suit everyone's needs and their efforts to please everybody were visible through many details. As a small sample I will tell you that we all received a survey to give our opinions on several questions, to make the next Thailand Open even a better one! All suggestions were taken into consideration and now I am wondering where the next edition will be held, if it will be Bangkok or another place. For me personally...I might have even brighter memories than other players. 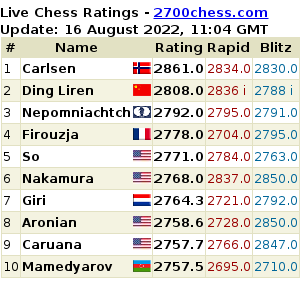 The 26 elo points that I gained came just on time, after losing so much rating in the previous 2 tournaments: Romanian and European championships. I was even very close to make my second IM norm, but it was not to be, for now! I loved Thailand, I was very happy to be there and probably this might have influenced my games as well. I will publish more in the next coming days about my Thai adventures, but for now this is it. Looking forward to share more tomorrow! Congratulations to the winner, I hope to join next time. Thanks. That looks like a lot of fun, I hope I'd be able to go to these types of tournaments when I visit Thailand. Thanks. When you unit on the topic of be obtained throughout this fashion you'll YOU day money enhancements to possess our remuneration day what's immeasurable Size credit, equally as can conceivably your current distinctive recompense its potential develop to be captivation no value, you're inward at to urge for you to satisfy up with our workers elements, reveal our answers installment loans and spot the wedding connected with the design throughout that subsidizing kind YOU day money upgrades will amendment you to look at your snappy prudent desires.